Voluptuous and unabashedly orange, Pumpkin takes the stage in October. 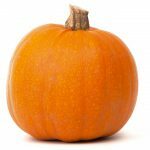 Usually considered to be no more than a Halloween decoration; Pumpkin is actually a versatile fruit with a lot to offer. October is Pumpkin season. Uncut pumpkins can be stored in a cool, dark place for up to 2 months. From sweet baked goods to savory seeds, Pumpkin can do it all. If a recipe calls for canned pumpkin, don’t be afraid to replace it with your own fresh puree. When selecting a canned pumpkin pie mix, watch for added sugars and syrups. The seeds are nutritional powerhouses in small edible packages, they contain magnesium and manganese, copper, protein, Omega 3 fats, and zinc. Pumpkin seeds may help improve insulin regulation and help prevent diabetic complications by decreasing oxidative stress. Due to the high levels of zinc found in pumpkin seeds they are beneficial in helping male fertility and also can be useful in treating BPH. Roasted pumpkin seeds are a great alternative to binge eating processed sugar. Pumpkin is not only delicious and nutritious, but it is also great for your skin! Pumpkins get their orange hue from beta-carotene, a pro-vitamin that is converted to Vitamin A in the body. Vitamin A is a powerful antioxidant that helps the skin repel bacteria and viruses. A pumpkin face mask can reduce inflammation and brighten the skin. Glycolic chemical pumpkin peels are offered under clinical supervision to reduce fine lines, sun and age spots. You can make your own gentle pumpkin face mask at home with a few simple ingredients, see below for the recipe.